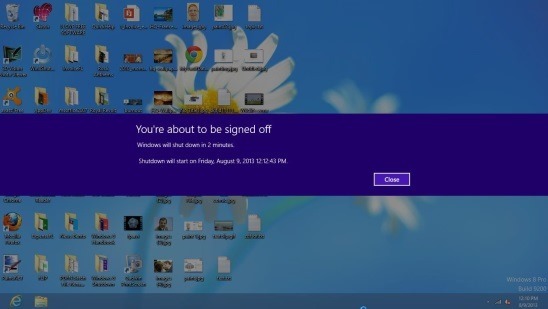 Windows 8 Shutdown is a free Shutdown Scheduler for Windows 8. It’s a simple and easy to use tool that lets you schedule system power off, sleep, and restart for future. The different shutdown options include: Standard Shutdown, Sleep Mode, Shutdown & Restart, and Full Shutdown. This app is very useful in those cases where some application runs automatically for a long period of time, and doesn’t requires much of your involvement. For example, downloading or uploading files of big sizes, updating big amount of data in company’s database, etc. So what you can do is keep all the requisite tasks running and schedule the system shutdown using the time field of this free shutdown scheduler. You can get this free Shutdown Scheduler by clicking here, or by using the link at the end of this article. Windows 8 shutdown is quite easy to use; the interface is kept simple and minimal. The app displays the basic functionality in two different views: Classic Windows Dialog Box and Windows 8 Tiles Dialog Box. The Classic view looks simple but contains additional setting options, while the Tiles view gives a proper Windows 8 metro UI feel, but hides the extending settings. You can switch between these views by pressing the green-colored Refresh button at the bottom right corner of the software’s interface. Below is the screenshot of the Classic Windows Dialog Box view of this free shutdown scheduler. As you can see that there are four shutdown options to choose from : Standard Shutdown, Sleep Mode, Shutdown & Restart, and Full Shutdown. The Shutdown options turns off the system, Sleep puts the system to Sleep mode, while Shutdown & Restart executes the system Restart action. The Standard Shutdown and Full Shutdown works similar except that the Full Shutdown takes longer time to start the system when you reboot next. All you have to do is set-up the estimated Shutdown Timeout (time after which the shutdown process begins) by clicking on the dropdown list, choose the requisite Shutdown option , and finally click on the respective Shutdown Button, to activate the automatic shutdown. After that you can carry out with your stuff. This utility will keep generating messages stating “You’re about to be signed off” along with the scheduled date and time, at regular time intervals. This notifies you and helps you to save everything before the shutdown process begins. You can set the shutdown timeout to seconds, minutes, hours, or days (0 secs to 7 days). Your system will get turned off automatically when the timeout time expires. It is not compulsory to activate shutdown while setting the shutdown options; you can activate the shutdown whenever you want! Simply choose the desired settings in Classic view and activate requisite shutdown anytime with a mouse click through the Tile view. Good utility tool for scheduling system shutdown. UI available in two views: Classic and Tile. Four shutdown options to choose from. 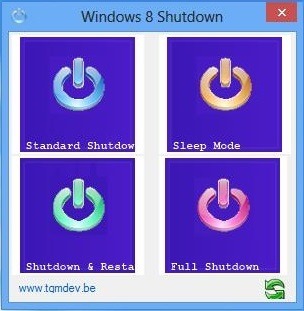 Windows 8 Shutdown is a very handy Shutdown Scheduler utility tool for Windows 8. You can use it to shutdown or restart your system automatically after a specific interval of time. Though there’s a “Sleep” option also available, it didn’t work in my case. 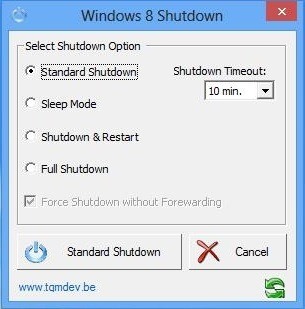 If you want to schedule shutdown on your Windows PC or don’t want to use the Windows Charms for shutting down your system, give Window 8 Shutdown a try! Also check out free Social Launcher app for Windows 8.